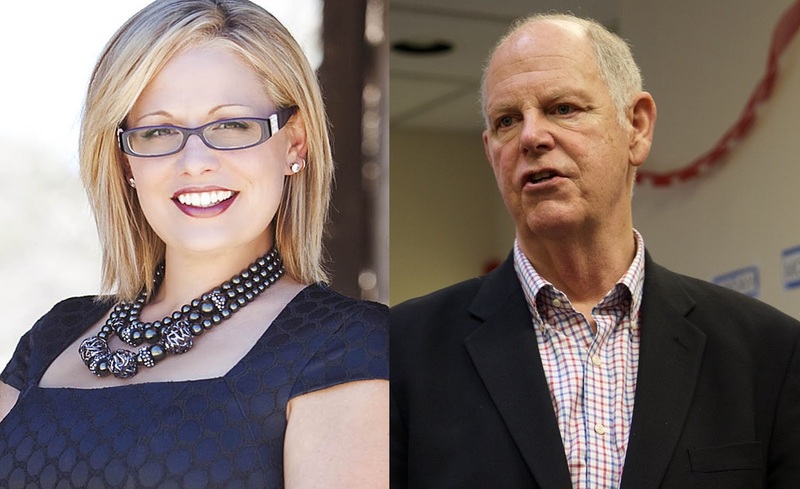 Arizona Reps. Tom O'Halleran (D-CD1) and Kyrsten Sinema (D-CD9) were two of only five Democrats voting this evening for the Defense Appropriations bill which includes what Republicans are trumpeting as a down payment on the President's border wall. The final vote on the $769 billion bill was 235-192. (Five Republicans also crossed the aisle to vote "nay", though none were from Arizona.) The contentious border wall funding was a key part of a so-called "mini-bus" of four appropriations bill dubbed as the "Make America Secure Act". Sinema's statement toed a similar line as O'Halleran's, noting the "bipartisan" nature and her opposition to the wall. “Our top priority is to keep Arizona families and our country safe. This legislation responsibly funds our military to ensure our men and women in uniform have the tools they need to protect our nation. "It gives our troops a 2.4% pay raise, funds programs like the A-10, Apache, and F-35 that support good Arizona jobs, and funds the Veterans Health Administration so our veterans can receive the care they deserve. By working together, we can keep our country safe and support servicemembers, veterans, and their families. On the flip side, Rep. Martha McSally (R-CD2) voted with nearly all of her Republican colleagues BUT conspicuously failed to mention the border wall funding in her extensive statement about the victory. “As a 26-year veteran of the Air Force, I am committed to ensuring that our military has the resources it needs to be prepared at all times and that our veterans receive proper care. This bill restores readiness shortfalls, gives our troops a pay raise, and invests in equipment and training for our troops to counter ISIS and other threats. It also provides funding for better and increased access to care for our veterans. The appropriations bill now heads to the Senate, where it will likely be significantly re-shaped. Senator Jeff Flake (R-AZ) hit pause on the Senate's healthcare debate this morning (AZ time) in order to pass an emergency bill to authorize the release of some of the donated funds to the two U.S.
Capitol Police officers injured last month in the Congressional Baseball Classic practice shooting. Flake - who himself was one of the heroes during that June 14 incident - asked for unanimous consent to pass the Wounded Officers Recovery Act (H.R. 3298). It was quickly given and the general debate on our healthcare system resumed. U.S. Capitol Police special agents Crystal Griner and David Bailey were at the early morning practice, and engaged in a shootout with the would-be assassin (he was killed). They have been treated and released. Their protectee, House Majority Whip Steve Scalise, was injured and got out of the hospital this week. The bipartisan bill was co-sponsored in the House by Arizona Reps. Tom O'Halleran (D-CD1) and Ruben Gallego (D-CD7). The measure was passed by unanimous consent in the House on Monday and now heads to the President. “I’ve stood in this place many times and addressed as president many presiding officers. I have been so addressed when I have sat in that chair, as close as I will ever be to a presidency. “It is an honorific we’re almost indifferent to, isn’t it. In truth, presiding over the Senate can be a nuisance, a bit of a ceremonial bore, and it is usually relegated to the more junior members of the majority. “But as I stand here today – looking a little worse for wear I’m sure – I have a refreshed appreciation for the protocols and customs of this body, and for the other ninety-nine privileged souls who have been elected to this Senate. “I have been a member of the United States Senate for thirty years. I had another long, if not as long, career before I arrived here, another profession that was profoundly rewarding, and in which I had experiences and friendships that I revere. But make no mistake, my service here is the most important job I have had in my life. And I am so grateful to the people of Arizona for the privilege – for the honor – of serving here and the opportunities it gives me to play a small role in the history of the country I love. “I’ve known and admired men and women in the Senate who played much more than a small role in our history, true statesmen, giants of American politics. They came from both parties, and from various backgrounds. Their ambitions were frequently in conflict. They held different views on the issues of the day. And they often had very serious disagreements about how best to serve the national interest. “But they knew that however sharp and heartfelt their disputes, however keen their ambitions, they had an obligation to work collaboratively to ensure the Senate discharged its constitutional responsibilities effectively. Our responsibilities are important, vitally important, to the continued success of our Republic. And our arcane rules and customs are deliberately intended to require broad cooperation to function well at all. The most revered members of this institution accepted the necessity of compromise in order to make incremental progress on solving America’s problems and to defend her from her adversaries. “That principled mindset, and the service of our predecessors who possessed it, come to mind when I hear the Senate referred to as the world’s greatest deliberative body. I’m not sure we can claim that distinction with a straight face today. “I’m sure it wasn’t always deserved in previous eras either. But I’m sure there have been times when it was, and I was privileged to witness some of those occasions. “Our deliberations today – not just our debates, but the exercise of all our responsibilities – authorizing government policies, appropriating the funds to implement them, exercising our advice and consent role – are often lively and interesting. They can be sincere and principled. But they are more partisan, more tribal more of the time than any other time I remember. Our deliberations can still be important and useful, but I think we’d all agree they haven’t been overburdened by greatness lately. And right now they aren’t producing much for the American people. “Both sides have let this happen. Let’s leave the history of who shot first to the historians. I suspect they’ll find we all conspired in our decline – either by deliberate actions or neglect. We’ve all played some role in it. Certainly I have. Sometimes, I’ve let my passion rule my reason. Sometimes, I made it harder to find common ground because of something harsh I said to a colleague. Sometimes, I wanted to win more for the sake of winning than to achieve a contested policy. “Incremental progress, compromises that each side criticize but also accept, just plain muddling through to chip away at problems and keep our enemies from doing their worst isn’t glamorous or exciting. It doesn’t feel like a political triumph. But it’s usually the most we can expect from our system of government, operating in a country as diverse and quarrelsome and free as ours. “Considering the injustice and cruelties inflicted by autocratic governments, and how corruptible human nature can be, the problem solving our system does make possible, the fitful progress it produces, and the liberty and justice it preserves, is a magnificent achievement. “I hope we can again rely on humility, on our need to cooperate, on our dependence on each other to learn how to trust each other again and by so doing better serve the people who elected us. Stop listening to the bombastic loudmouths on the radio and television and the Internet. To hell with them. They don’t want anything done for the public good. Our incapacity is their livelihood. “Let’s trust each other. Let’s return to regular order. We’ve been spinning our wheels on too many important issues because we keep trying to find a way to win without help from across the aisle. That’s an approach that’s been employed by both sides, mandating legislation from the top down, without any support from the other side, with all the parliamentary maneuvers that requires. “We’re getting nothing done. All we’ve really done this year is confirm Neil Gorsuch to the Supreme Court. Our healthcare insurance system is a mess. We all know it, those who support Obamacare and those who oppose it. Something has to be done. We Republicans have looked for a way to end it and replace it with something else without paying a terrible political price. We haven’t found it yet, and I’m not sure we will. All we’ve managed to do is make more popular a policy that wasn’t very popular when we started trying to get rid of it. “I voted for the motion to proceed to allow debate to continue and amendments to be offered. I will not vote for the bill as it is today. It’s a shell of a bill right now. We all know that. I have changes urged by my state’s governor that will have to be included to earn my support for final passage of any bill. I know many of you will have to see the bill changed substantially for you to support it. “We’ve tried to do this by coming up with a proposal behind closed doors in consultation with the administration, then springing it on skeptical members, trying to convince them it’s better than nothing, asking us to swallow our doubts and force it past a unified opposition. I don’t think that is going to work in the end. And it probably shouldn’t. “The Obama administration and congressional Democrats shouldn’t have forced through Congress without any opposition support a social and economic change as massive as Obamacare. And we shouldn’t do the same with ours. “Why don’t we try the old way of legislating in the Senate, the way our rules and customs encourage us to act. If this process ends in failure, which seem likely, then let’s return to regular order. “Let the Health, Education, Labor, and Pensions Committee under Chairman Alexander and Ranking Member Murray hold hearings, try to report a bill out of committee with contributions from both sides. Then bring it to the floor for amendment and debate, and see if we can pass something that will be imperfect, full of compromises, and not very pleasing to implacable partisans on either side, but that might provide workable solutions to problems Americans are struggling with today. “What have we to lose by trying to work together to find those solutions? We’re not getting much done apart. I don’t think any of us feels very proud of our incapacity. Merely preventing your political opponents from doing what they want isn’t the most inspiring work. There’s greater satisfaction in respecting our differences, but not letting them prevent agreements that don’t require abandonment of core principles, agreements made in good faith that help improve lives and protect the American people. “The Senate is capable of that. We know that. We’ve seen it before. I’ve seen it happen many times. And the times when I was involved even in a modest way with working out a bipartisan response to a national problem or threat are the proudest moments of my career, and by far the most satisfying. “This place is important. The work we do is important. Our strange rules and seemingly eccentric practices that slow our proceedings and insist on our cooperation are important. Our founders envisioned the Senate as the more deliberative, careful body that operates at a greater distance than the other body from the public passions of the hour. “We are an important check on the powers of the Executive. Our consent is necessary for the President to appoint jurists and powerful government officials and in many respects to conduct foreign policy. Whether or not we are of the same party, we are not the President’s subordinates. We are his equal! “As his responsibilities are onerous, many and powerful, so are ours. And we play a vital role in shaping and directing the judiciary, the military, and the cabinet, in planning and supporting foreign and domestic policies. Our success in meeting all these awesome constitutional obligations depends on cooperation among ourselves. “The success of the Senate is important to the continued success of America. This country – this big, boisterous, brawling, intemperate, restless, striving, daring, beautiful, bountiful, brave, good and magnificent country – needs us to help it thrive. That responsibility is more important than any of our personal interests or political affiliations. “We are the servants of a great nation, ‘a nation conceived in liberty and dedicated to the proposition that all men are created equal.’ More people have lived free and prosperous lives here than in any other nation. We have acquired unprecedented wealth and power because of our governing principles, and because our government defended those principles. “America has made a greater contribution than any other nation to an international order that has liberated more people from tyranny and poverty than ever before in history. We have been the greatest example, the greatest supporter and the greatest defender of that order. We aren’t afraid. We don’t covet other people’s land and wealth. We don’t hide behind walls. We breach them. We are a blessing to humanity. “What greater cause could we hope to serve than helping keep America the strong, aspiring, inspirational beacon of liberty and defender of the dignity of all human beings and their right to freedom and equal justice? That is the cause that binds us and is so much more powerful and worthy than the small differences that divide us. “What a great honor and extraordinary opportunity it is to serve in this body. “It’s a privilege to serve with all of you. I mean it. Many of you have reached out in the last few days with your concern and your prayers, and it means a lot to me. It really does. I’ve had so many people say such nice things about me recently that I think some of you must have me confused with someone else. I appreciate it though, every word, even if much of it isn’t deserved. “I’ll be here for a few days, I hope managing the floor debate on the defense authorization bill, which, I’m proud to say is again a product of bipartisan cooperation and trust among the members of the Senate Armed Services Committee. “After that, I’m going home for a while to treat my illness. I have every intention of returning here and giving many of you cause to regret all the nice things you said about me. And, I hope, to impress on you again that it is an honor to serve the American people in your company. Sen. Flake Deciding Vote On New Obamacare Repeal Effort? Arizona Senator Jeff Flake (R) - up for re-election next year, not coincidentally - is in the glare of the national spotlight today as the possible deciding vote on the latest Senate effort to repeal the Affordable Care Act. "I'm still digesting it," the Senator told reporters this morning after the new version was released. "I'll be doing that for awhile," he added. Flake is facing mounting pressure from both his right and his left. Texas Senator Ted Cruz singled him out for praise this morning on KFYI this morning, after Flake told the station that he would be supporting Cruz' amendment permitting non-compliant plans to be sold alongside Obamacare-compliant health insurance policies.